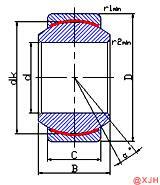 Spherical Plain Bearing GE.FW Series is used for through shafts with large stiffness and deflection. These bearings have seals on both sides to prevent intrusion of dirt. It is factory-filled with a suitable amount of lubricant, no need to be cleaned before installation, no need to add lubricant. When the top wire screw on the protruding end of the inner ring of the bearing is fastened on the shaft, the allowable axial load shall not exceed 20% of the rated dynamic load. 1) Sliding contact surfaces: Steel vs. PTFE sintered bronzed mesh. 4) Features of structure: Without oil groove or oil hole. Outer race formed by extrusion. With a PTFE sintered bronzed mesh between outer race and inner race. 5) Properties: Self-lubricated, good wearability, self-alignment. Before installing the Spherical Plain Bearing GE.FW Series on the shaft, the bearing pin of the bearing sleeve must be removed, and the surface of the journal should be smoothed and cleaned, and oiled and rust-proof at the journal. Apply lubricant to the bearing seat and bearing mating surface, and install the bearing into the bearing housing. Then the assembled bearing is placed on the shaft together with the bearing housing. Push to the desired location for installation. The bolts of the fixed bearing housing should not be tightened first, so that the bearing housing can rotate in the bearing housing. Also install the other end bearing and seat on the same shaft, turn the shaft a few turns, and let the bearing itself automatically find the position. Then fasten the bearing block bolts. Finally install the eccentric sleeve.